Check out Marianne at NYHRC and Facebook! Let's unleash the dancer in you! I am a professional New York City ballroom dance champion, instructor and coach to the stars (youtube video with Antonio Banderas). 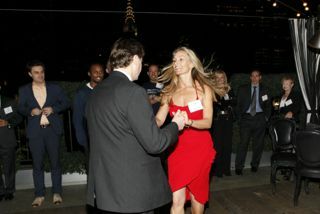 Watch me teach a Salsa class on TV's WB11! Check out my FACEBOOK page! Located in Manhattan, I've been training beginners to professionals for years with great results: from the average person and wedding couples to finance powerhouses, Broadway stars and celebrities. I have developed my own very effective ballroom dance technique that teaches people the basic foundations up to advanced techniques in any dance style with quick results. For the last 21 years I have been teaching a variety of students ranging from beginner to professional. "Each of Marianne's classes is an epiphany, the steps and tempo become clear. It is as if I were in a master class rather than such a mixed group." (about Ms. Hettinger's open-level group classes at New York Health&Racquet Club) -Paul Cardile, HRC member and dance aficionado. ""We all had an amazing time working with you. I watched your reel and you are insanely brilliant." - Lucas Zachary Hazlett, comedian of "Family Haircut". May 2016: Marianne performed an Argentine Tango improvisation for the tango-in-film festival at the Cinematheque Quebecoise prior to the screening of her feature film "Mango Tango", which she wrote, directed and also dances in. February 2015: Marianne's dance student Amy Bravo lost 70 pounds and been able to keep the weight off by dancing herself into shape in Marianne's classes! August 2014: Marianne coached Olympic boxing coach Michael Kozlowski and his wife Olesya Malyuta. May1st, 2014: Marianne performed a sold-out tango show with Stefan Zawistowski to live music by the great Argentinian musician Horacio Laguna at the Queens Public Library Auditorium. 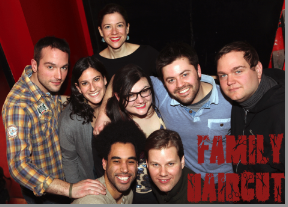 April 14th, 2013, Marianne coached and taught Salsa and Tango moves to the Comedy Team "Family Haircut". Oct. 28th, 2012, Ms. Hettinger taught 'Elvis Presley moves' to a financial whiz from Wall Street for his Halloween performance. Dancing gives him a chance to refuel and provides a welcome relief from the pressures of the stockmarket. Sept.24th, 2012, Ms. Hettinger represented the New York Health & Racquet Club at a press event and gave a Salsa dance demo for producers of The Today Show, The Chew, Dr. Oz, Good Day NY, Fox & Friends as well as reporters/freelancers/editors for The New York Times, Family Circle, Men's Health, Women's Health, Health magazine, Prevention, Shape, Self, Seventeen, and Reuters. Sept.22nd, 2012, Marianne performed a tango show with Stefan "El Polaco' to live music by Horacio Laguna at the Queens Public Library auditorium. July 29th, 2012, Marianne's films ,"Saint Vitus Dance" and "Strad for Lunch", were screened in Augsburg, Germany. Both films feature dance scenes. Marianne improvised a tango with David Schneider from the Munich tango scene live to one of the pieces. July 7th, 2012, Marianne was invited to perform an Argentine tango and milonga with Stefan Zawistowski in honor of the Argentinian Independence Day in NYC at the Immanuel Lutheran Church on the Upper East Side..
My exercises are anti- ageing, with great health benefits. In my classes you will learn partner dance in a fast and simple way. This will be a great shortcut to help make anybody feel comfortable on the dance floor.